Canadian natural gas producers are scrambling to avoid the price disadvantage hobbling the country’s tar sands/oil sands industry, working on “a flurry of export and chemicals projects to avoid the same fate,” Bloomberg reports, in a post republished by JWN Energy. That situation “mirrors the predicament of the nation’s oil industry, where production overtook pipeline space, hammering prices down to record lows and prompting an unprecedented intervention from Alberta’s government,” the news agency explains. While gas producers are “working overtime to escape a similarly bleak future,” data compiled by Bloomberg shows gas selling at record-low prices in the U.S.
“Just as the oil producers are struggling to get their product to market, the Montney has got a great resource with no easy way to access markets,” said RS Energy Group Director Jen Snyder. So gas producers are working on a range of alternatives, from liquefied natural gas (LNG) exports to plastics and petrochemical production. 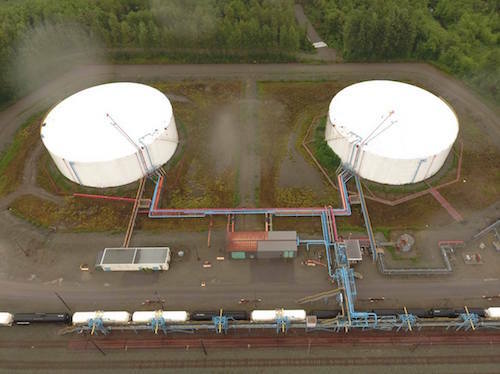 The C$40-billion LNG Canada megaproject, already expected to blow a massive hole in British Columbia’s carbon budget, won’t bring much relief to the gas business as a whole, since the project will be supplied almost entirely by members of the consortium led by Royal Dutch Shell. But Bloomberg says a group of 10 natural gas companies, representing 20% of Canada’s production, have hired a consulting team to evaluate options for a new LNG export facility on the Pacific coast. Options could include supporting an existing LNG project or restarting work on a dormant proposal. • An $8.6-billion pipeline expansion in which TransCanada Corporation plans to add 3.2 billion cubic feet of capacity to its western Canadian gas system by the end of 2022.